Don’t miss our Raising Cane’s fundraiser coming soon! Since Millard West Show Choirs is on a mission to make Music Lives Show Choir Competition even bigger and even better, we are also on a mission to raise the funds to do just that while spreading a little Raising Cane’s ONE LOVE in the process! And what better way to raise money than to let someone else do the cooking? Let’s be real. Those delicious finger-lickin’ chicken tenders, perfect Texas Toast, and the world’s best french fries will definitely be worth the trip! So bring the family to Raising Cane’s at 14548 West Center Road, Omaha, Nebraska, on Thursday, October 11th from 4-8 pm. 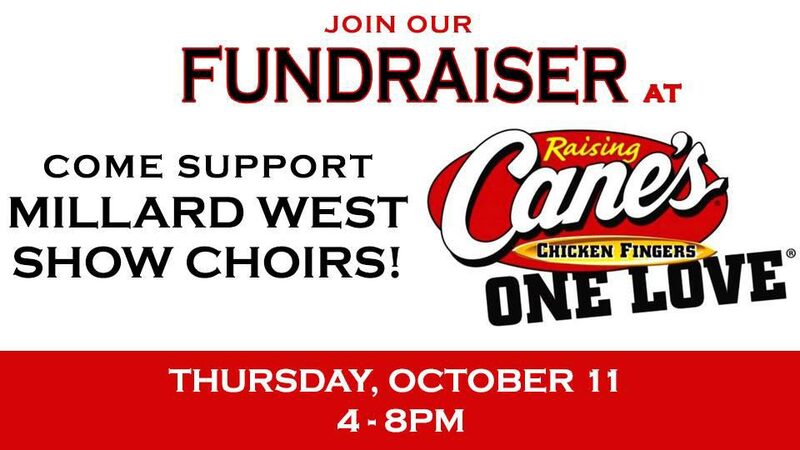 Mention this fundraiser and Raising Cane’s will donate 15% of your order to Millard West Show Choirs and the Music Lives Show Choir Competition. Click here and share the Facebook event!